I am a professional landscape photographer that shoots 95% of my work using Fuji Velvia 50 film. I use a relatively aged Pentax 67II medium format camera. Nowadays that makes me something of an oddity, the sizable majority having adopted one or other of the digital formats. In spite of commercial pressure to the contrary, film still has relevance and offers a substantial part to play in the field of one particular genre of photography... landscape. Film has a unique, enchanting and repeatable character which is remarkably difficult to convincingly mimic, but sadly film has become marginalised, hard to find, harder still to get processed, and the price of both has escalated. A new generation of photographer has arisen that has probably barely heard of film, in all sincerity, if you've never seen for yourself the sheer jewel like quality of a well exposed transparency placed on a light box, or better still projected on a screen, then you will probably never know why film shooters still persist with such an antiquated medium. 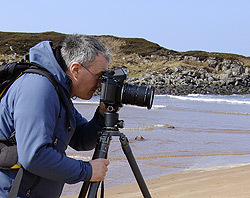 Fuji is a photographic company with long standing history and experience. It is one of the few manufacturers that genuinely supports film, though I do believe it has taken advantage of it's exclusive market position. Kodak stopped making film years ago but in a surpise move it appears that they now believe that film is an option worth tapping and they have re-introduced a new Ektachrome line up, so hopefully that will make the film genre more widely available and more competitively priced. I am often being told by photographic retailers that film is experiencing something of a renaissance in much the same way as vinyl did when it too was marginalised by the explosive popularity and convenience of the compact disc. But, the undeniable truth is, that most folk these days save their images to a computer rarely printing the output and so at some stage film must be managed so that it can be presented in a digital format easily accessed by all, and that is where film scanning becomes relevant. There are basically four types of scanner on the market, flatbed, dedicated film, virtual drum and true drum scanners. There is a lot of opinions voiced on the relative merits of each type. I have no intention of getting involved in a pointless protracted argument as to the relative merits of each. One thing is definitely true, just because you have access to a first rate film scanning unit, that doesn't necessarily translate to a first rate film scan, the experience of the operator is at least as important. In my opinion film scanning obeys a law of diminishing returns ie. you have to spend an awful lot more to get only a little better result.